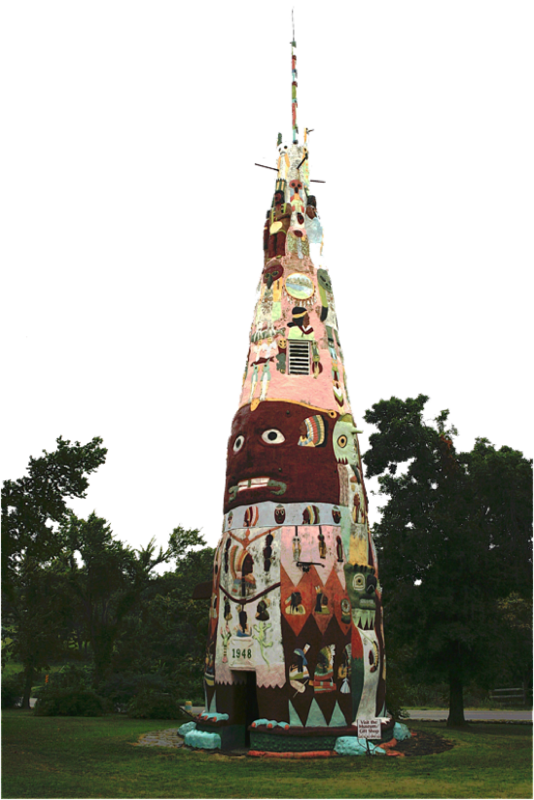 Just four miles east of Route 66 in Foyil, Oklahoma is Ed Galloway's Totem Pole Park. Galloway started the park in 1937 when he retired from his job as woodworking instructor at the Sand Spring Children's Home. His inspiration came when he carved a turtle from a rock outcropping in his yard. Eventually the turtle became the base of his largest construction, the 90 foot, 6 room totem pole. He completed the large totem pole 11 years later in 1948 and the park in 1962 after 25 years of work. 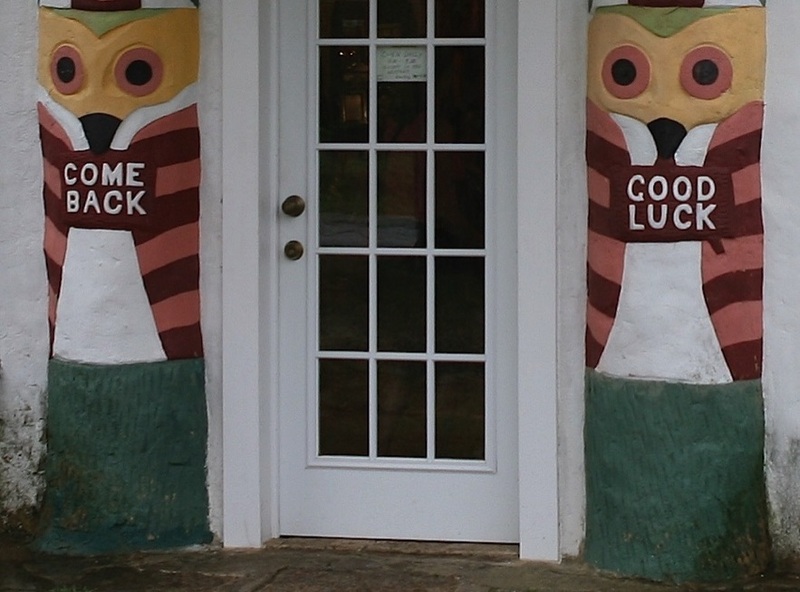 By the time he finished Totem Pole Park he had a fiddle house (the gift shop) to display the 300 fiddles. He made each of a different wood and many other constructions including gates, a barbeque, picnic tables and other thematic sculptures including a large arrowhead. After his death in 1962 the park was abandoned for over 20 years before it was restored by the Kansas Grassroot Art Association in 1983. Galloway never charged admission to the park and instead enjoyed the visitors who came to see his creations. The free park is open everyday and now owned by the Rogers County Historical Society and the Foyil Heritage Association. One of the gate constructions in the park. The base of the arrowhead sculpture has a fish with a spear in it. A cement tree with various bas-reliefs of animals, birds and faces depicted on its surface. The turtle at the base of the large totem pole. Surface detail of the large totem pole. Humming bird and and logs, front. Owl and and logs, back. The Fiddle House built in the shape of a Hogan housing over 300 violins that Galloway made. Detail of face from Hogan. Some of the Fiddles on display. Wood framed wall paintings from the interior.